We finally got our first real snow this weekend! 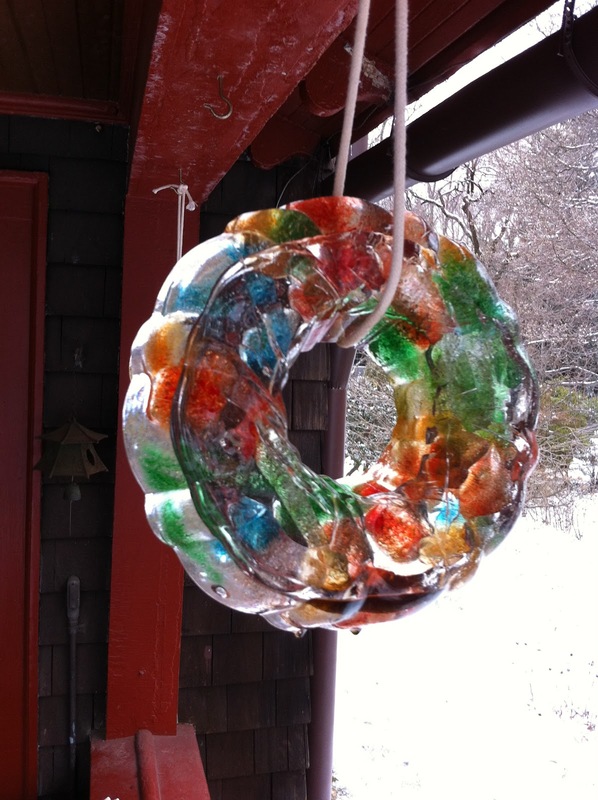 To celebrate we made some fun ice sculptures to add a little color to the white and gray landscape. 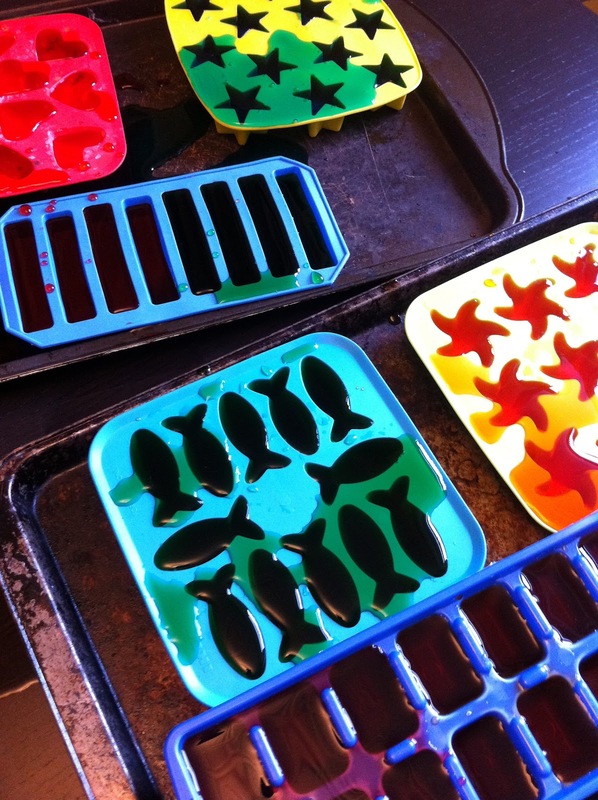 We begin by pulling out the large collection of fun shaped ice cube trays, which we have actually never used for ice despite having them for years. The Bee then helped me mix up some water with food coloring, which we poured into the molds. Since I knew it was going to be so cold out we just left them on cookie trays on our back porch over night and found them fully frozen, along with everything else, in the morning. 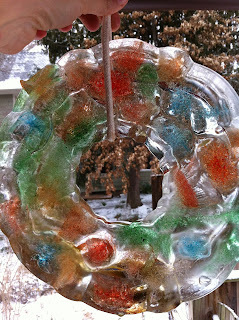 We dumped the colorful ice out in the snow, which was a work of art in itself. 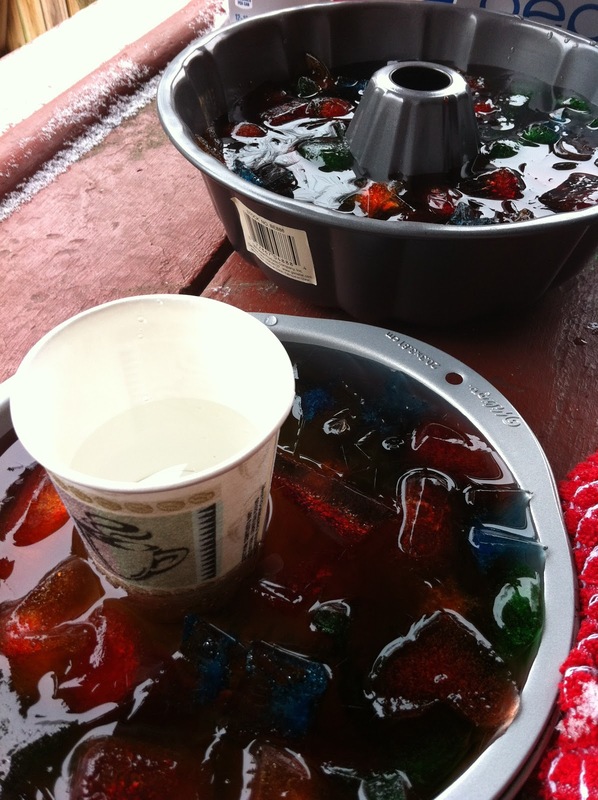 The Bean and Bee then picked up all the colorful ice cubes and put them into a bunt pan and a cake pan. I then filled both of the pans the rest of the way with water before leaving them on the back porch for the night. 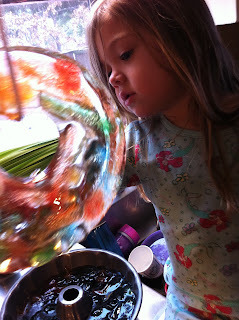 I wanted to make ours hanging sculptures so we used the bunt pan and for the cake pan I put a plastic cup in the middle before pouring the water in so that it would also have a hole to hang by. The following morning we brought the sculptures in, dipped the pans quickly into warm water and then the sculptures easily slipped out. The Bee was amazed by the ice although the sculptures were quickly starting to melt in the house, so she didn't get to look to long. I quickly tied a rope through each of the sculptures and we hung them outside. They look beautiful in the snow! I am curious to see what happens to our sculptures today and tomorrow when the temps here are supposed to be in the 50's. Oh I love the idea of putting stuff in them! I bet that looked beautiful! What did you use in yours? Mostly leaves the first time, and bits of herb - blogged here http://inkspotsandgrassstains.blogspot.com/2011/01/ahh-now-thats-better.html. The next time we did it we used pretty leaves, acorns, conkers, dried flowers, I think a small toy in one of them! 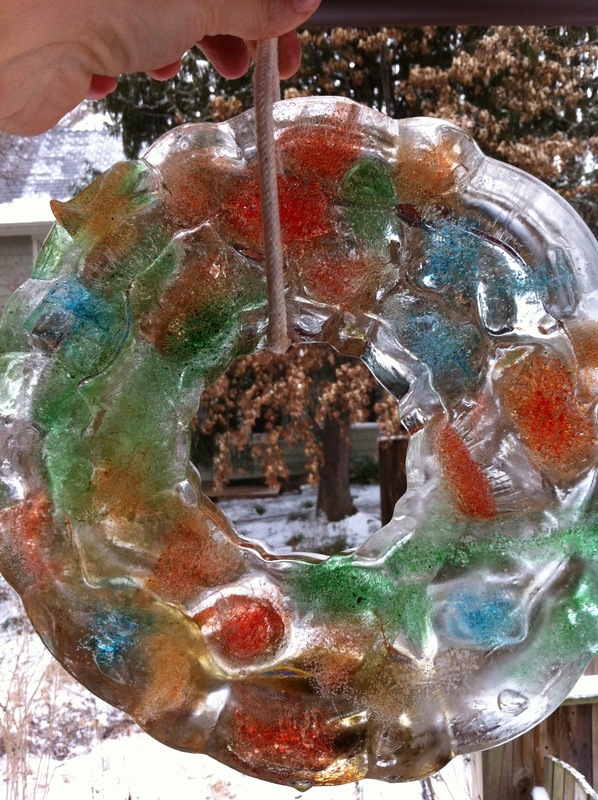 That an easy project and it looks really neat. We'll have to make some too.